The excitement. The thrill. The preparation. The airplane ticket has been purchased, the itinerary confirmed, and then the inevitable panic strikes: how do I pack in one suitcase for three weeks abroad?! As a destination wedding photographer, I’ve had plenty of experience packing camera gear and outfits for weekend business trips, but three weeks of variable activities and touring is no simple tasks. I compiled extensive lists, created flow charts (don’t judge) and researched fashionista techniques. Somehow, it all worked. During my three weeks in China, I didn’t wear the same outfit twice, I had plenty of outfits left to wear, and I had a diverse selection of clothes as diverse social settings required. I took a total of three pairs of shoes: my trusty Converse, my comfortable-but-cute bow-topped Keds, and a pair of running shoes. In hindsight, I could’ve managed perfectly well without the running shoes (the treadmill at our hotel was broken, and there was no way I could jog outside in the smog-filled city streets), but I was glad to have the Nike’s. I had four shirts with me and three layerable jackets. Each shirt could be worn individually, or with one (or more!) layers for maximum impact and variable temperatures. Even the jackets could’ve been worn as stand-alone tops, if I’d desired it. 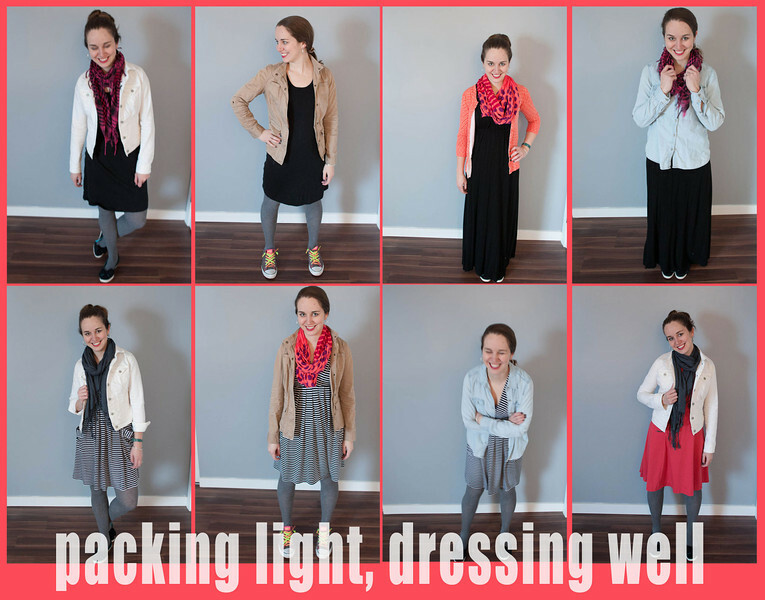 (Plus: my chambray shirt can be warn as the base layer or as an over layer. Double win!) Looking back, I probably didn’t need both a khaki and a white jacket; but the khaki is slightly more casual comfortable, while the white denim is snazzy and can be dressed up as the situation requires. For full disclosure, I took two very similar pair of jeans as a precaution, but I really only needed to have one. My staple in travel wear, I love the functionality of a dress as a base layer and I consistently prefer flying in a maxi dress. It’s comfortable, fully modest (no matter how I squirm while trying to sleep on the red-eye! ), and versatile. Plus, in cultures more formal than the American/Canadian environment I’m used to, layered dresses are an easy way to look beautiful while feeling comfortable. Not pictured, but a staple in my packing: I take two pair of yoga pants and one sweat shirt that can act as both active wear and PJ’s. Interchangeable, for maximum impact, and functional with the already-packed layering tshirts. Though it fits in my suitcase, I don’t include it in my “number of pieces” tally. A pair of tights, three scarves, and a selection of earrings, and I’m all set. 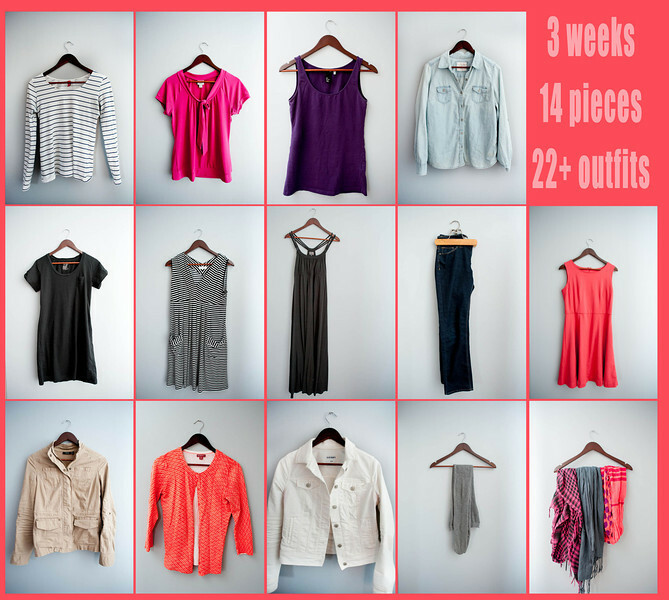 By layering, accessorizing, mixing, and contrasting, I easily crafted the necessary 21 outfits for my three weeks in China. I probably could’ve lost two (or even more!) of the pieces while maintaining an adequate number of classy combinations, but let’s face it: Variety is the spice of life – why lose that if you don’t have to? 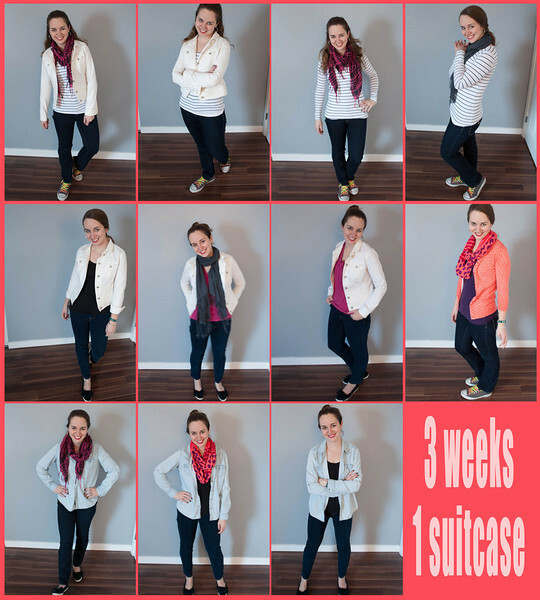 What are some of your best tips for packing light and still dressing well? Share with us and you could be featured in a future post here on adornabelle! Yay I love this kind of thing 🙂 I’m not very good at it, but I love how you can create such different looks with a few basic things!